Brief Synopsis – A college is forced to use students on the football team after they abuse the rules of conduct. My Take on it – I recall seeing this in the theater back when it came out and my memories of it were much better than this film actually is. This actually feels like they took the plot and structure of Major League (1989) and adapted it to college football. Scoot Bakula plays the Tom Berenger type leader of the team who even tries to win the heart of a girl from his past. (granted, he doesn’t know that). 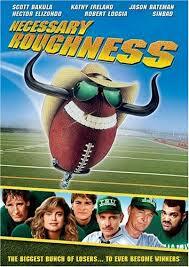 Hector Elizondo plays the washed up coach hired not necessarily to win. Robert Loggia plays his right hand man who doesn’t realize he is qualified to coach. The players are all either stereotyipcal or over the top and very few of the jokes or sight gags work here. Larry Miller plays a school Dean who doesn’t want them to win and will do everything in his power to do so. Bottom Line – Not as funny or as entertaining as I had recalled. Even some great casting doesn’t help here because all of the characters are either stereotypical or over the top. Feels too much like a copy of Major League (1989) and doesn’t come anywhere close to being as much fun.